Most travelers flock to Morocco's famous cities, such as Marrakech and Fez, in search of North African creativity and culture. But if you're looking for creativity and culture, I recommend heading straight into the desert. 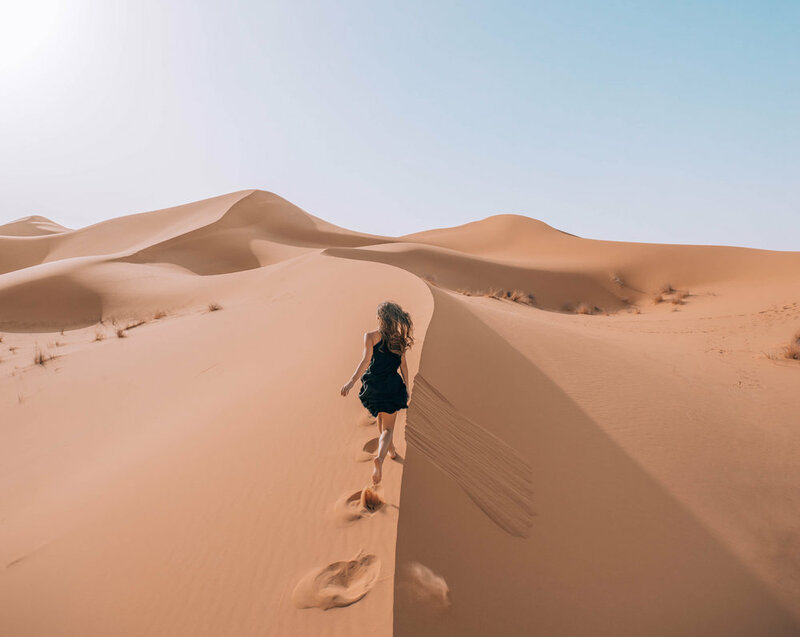 With breathtaking landscapes, fascinating indigenous culture, beautiful handicrafts, and palatial accommodations, you won't want to leave Morocco without making a trip to the Sahara Desert. I grew up in the Southwest American desert. And while over the years I’ve come to better appreciate that part of the country and its desolate landscapes, it’s certainly not my ideal setting for a vacation. So although I knew Morocco’s desert would be different, I hardly expected it to be the highlight of my entire two-week trip. Spoiler alert: it was. Most Morocco bucket lists cover the major cities, famous photo ops, and typical activities — shop in the medinas; stay at a stunning riad; eat tagine; figure out how to stuff that new camel wool rug into your suitcase. And while you should definitely do all of these things, you also shouldn't leave Morocco without a Sahara Desert getaway. These are just some of the reasons why. Let’s start with the obvious: the iconic golden dunes of the Sahara Desert. Vast lifeless landscapes and silence so intense you can hear your own heartbeat. An empty horizon lined with soft rolling hills, broken up only by the occasional camel caravan, black raven, or fluffy owl darting across the similarly empty sky. A sheet of yellow against a sheet of blue, resembling some serene two-dimensional painting. Anyone who doesn’t believe in love at first sight hasn’t been to the Sahara Desert. Truly, the Sahara Desert sand dunes are unlike anything I’ve ever seen before. And, coming from Arizona, I’ve seen a lot of desert. But there was something so painfully beautiful about the time we spent running around in the Sahara. At sunrise, the sand is pale pink in the not-yet-morning light, soft and cool as liquid under your bare feet. Slowly, the sun creeps overhead, blazing hotter and hotter, creating deep shadows that trace the crests of the fiery gold dunes. By nightfall, if you’re lucky, a giant African sun sinks behind the hazy horizon, illuminating the sky in colors you wouldn't believe could exist in nature. Then, in a moment, the sky falls black as it prepares for the grand finale. Billions of stars flicker to life overhead and the unobstructed Milky Way dances across space. The only other light nearby coming from a small candlelit lantern or roaring fiery torch as it leads you back to your cozy bed for the night. There’s no surer way to fall head over heels for this beautiful earth. So don’t miss it. Believe it or not, around two million people still inhabit the Sahara Desert. In Morocco, Berbers were among some of the easiest inhabitant of the desert, with origins as early as 3000 BC. 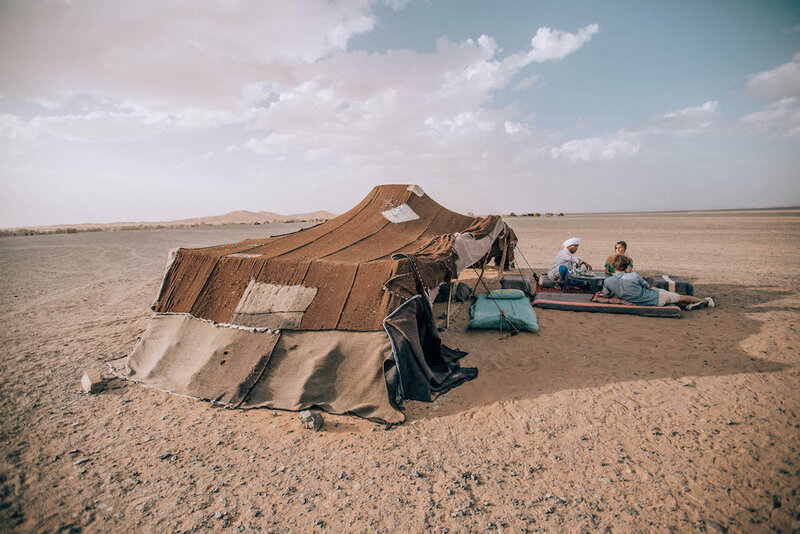 Many Berbers maintain the same nomadic way of life as their bronze age ancestors, moving about the desert in pursuit of a fleeting water supply. Although "Berber" is the more universally understood term, the indigenous people themselves prefer to be called Amazigh (“amazee”), meaning “free people.” I learned from our guide Amed, who grew up in the desert as a nomad, that this terms holds deeply bittersweet significance. Berber culture, as a general rule, denies barriers and borders. In a tangible way, up until the 1960s, no real country borders existed in the Sahara Desert, and Berbers were able to pass through freely. With the fall of colonization and at the height of territorial tensions, non-proverbial lines were drawn across the sand. The divisions were abrupt, and left a divided desert and divided families. Border lines literally split families apart, placing some family members in Morocco and others in neighboring Algeria. But this "free people" identity runs deeper than a resistance to geopolitical borders. Berbers also claim to not divide people based on religious, ethnic, gender, economic, or other social divides. Being “free people” is taken to heart, infecting all aspects of human social structure with a sense of acceptance and unity. Women are particularly empowered in the culture, known as the guardians of Amazigh identity. In fact, it is the women who are entrusted to pass down culture and ensure its continuation in later generations. Courtship customs are another aspirational area of Berber culture. Social anthropologists have identified Berber courtship practices, known as Takerfiyt, as the one of the most successful systems in the world for finding a life partner. Following a schedule of intentional “dating,” the man and woman aim to build trust (through months of daily meetings to ask questions, discuss the future, etc. ), respect, and family unity (although 99% of the decision is up to the man and woman, the last 1% is based on advice from the families). Because honesty and respect are of utmost importance in the process, no sexual relations occur until after the wedding. Takerfiyt is thorough, empowering to women, and family-oriented. And, according to human behavior experts, the rest of the world has a lot to learn from it. 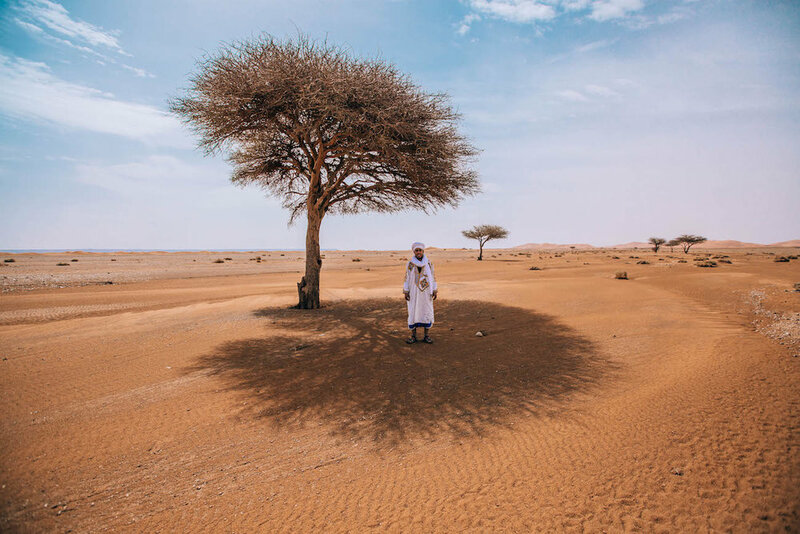 Despite intensely limited resources and foundations that drift with just the wind, the Sahara Desert boasts some of the most stunning accommodations on the planet. Although your options are not unlimited, they are nonetheless impressive. Choose between a desert “auberge” (bed and breakfast) or a desert camp. Or better yet, try both. Most visitors choose to stay in a desert camp with tented rooms, but be warned that lower-cost camps will correlate with more “rugged” living conditions. Considering there’s about a 50% chance you’ll face a sandstorm while out in the desert wilderness, you might want to save the "rugged" for another time. My suggestion: splurge on luxury. 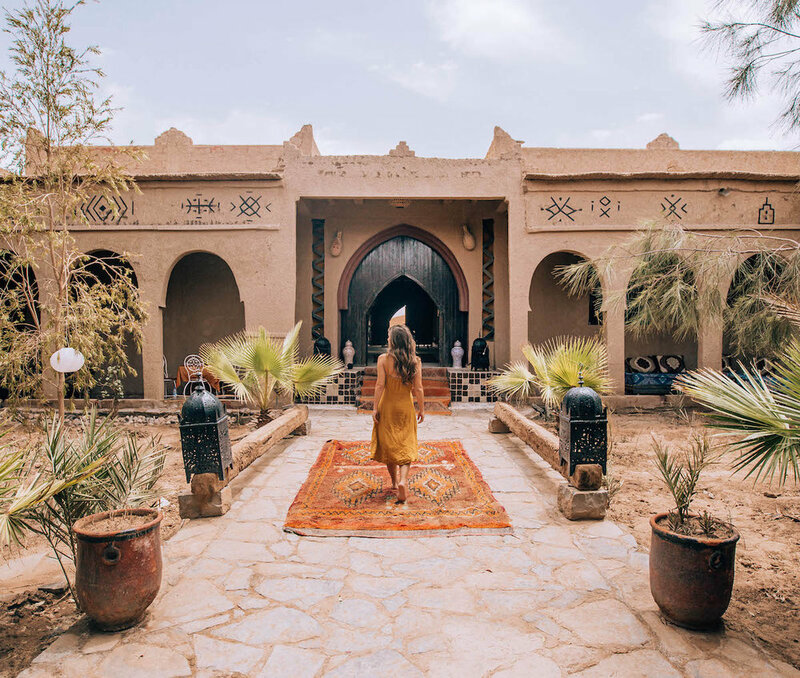 Imagine arriving at your secluded camp (preferably not by camel, which is the world’s most uncomfortable form of transport), decorated with colorful Moroccan rugs, squashy woven poufs, carved wood furniture, and white draped tents dotting the sandy landscape. A home cooked dinner is served under the stars, or in a palatial tent if a desert storm pushes you indoors. An epic sunset is followed by a starry midnight sky. You plop your heavily-fed self on a giant camel-wool pouf around a bonfire, being lulled to sleep by the groans of nearby camels and the beat of Berber drums. Led by a lantern back to your tent, you fall asleep in a tented room so luxurious that it would have the Four Seasons swooning. There are so many luxury camps from which to choose, but I personally recommend Sahara Stars Camp. I had a perfect stay there, even in desert rainstorm, and it’s stellar reviews can back me up. If for some utterly insane reason the desert camp doesn’t sound appealing (or if you just want to switch it up on a multi-night Sahara getaway), another option is a desert “auberge” (your desert version of a bed and breakfast). Like the luxury camps, many of these auberges are decorated like North African palaces, with an undeniably Berber feel. You’ll find better plumbing, tents replaced by mud and straw walls, and easier access to modern-day basics like WiFi and electrical outlets. I recommend Auberge Takojt, with charming earthy “kasbah”-like interiors, a beautifully decorated courtyard, and traditional Berber touches everywhere you look. You’ll experience true Berber hospitality, including a home-cooked meal under the stars (if you ask nicely) and some enchanting Berber tunes guitar lullabies likely played by Amed himself. They even served us a midnight dinner under the stars, which was a Morocco highlight for all of us. Yes, the desert is serene and peaceful and yes, I started this post out with a romantic “ode” to sand dunes. But for all you adrenaline junkies out there, the desert is for you, too. Or maybe you’d prefer to strap your feet into a sandboard and “surf” down the dunes as if they were made of slippery snow. My recommendation is to try both, then get some rest at the campfire and go at it again the next day. Enjoy. Although it’s true that the Berber people make up only one specific ethnic group in Morocco, the ethnic and cultural identity among desert people is some of the oldest and strongest in the country. What I personally loved about Berber culture is that so many aspects of it stem from some expression of creativity. Berber people are renowned artisans, making some of the highest quality handicrafts in the country. Rugs of woven camel hair and cactus silk; silver jewelry decorated with amber, coins, shells, and glass; traditional hand-welded swords and knives — every piece looks as if it belongs in a museum. Most important, every piece holds a story and symbolizes some aspect of Berber culture. Be sure you learn the backstory before you take home the goods you buy, or you’ll miss half the treasure. In addition to their handicraft skills, the Berber people are excellent musicians. Legends, histories, and culture are all passed down orally in the Berber community. So it follows that, from the beginning of Berber history, music has been an essential medium through which stories and information were shared. You’ll find that the lyrics of these songs, if you translate them, are meaningful messages of family, relationship, war, and identity. These enchantingly beautiful folk tunes will transport you to a different time, showering you in those “free people” vibes. But Berbers aren’t the only group in the desert with international musical fame. The Gnawa, an ethnic group in Morocco and Algeria, is renowned for its hypnotic trance-like music. Most notably, the Gnawa use these songs, marked by low-toned rhythmic patterns, in various spiritual and healing rituals. 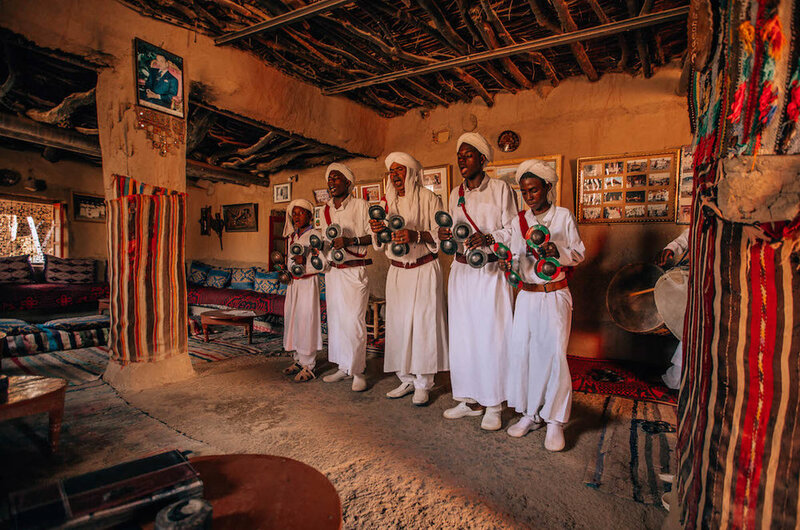 While you’re in the desert, you can visit the Gnawa community and listen to a musical performance. Be sure to bring some cash and show your support by leaving a tip or purchasing a CD! The Sahara Desert is huge. But don't be overwhelmed. 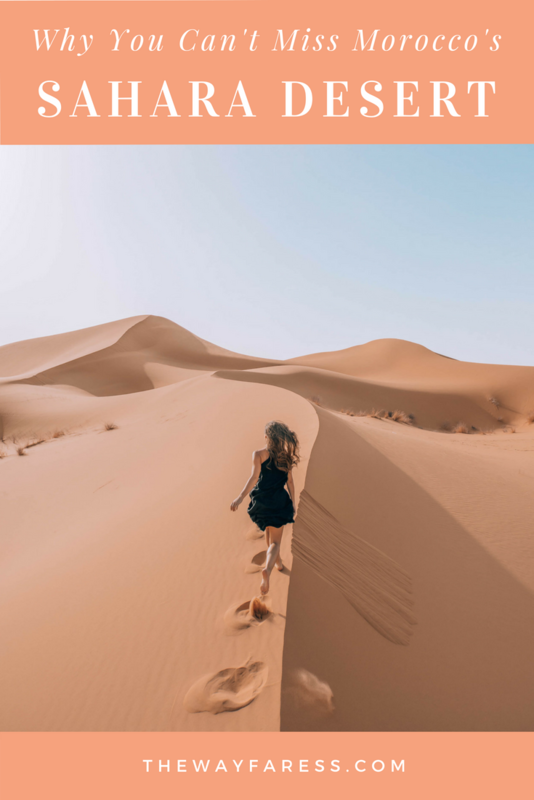 For your getaway, I recommend visiting Merzouga, a small village near the Algerian border known for its huge expanse of sand dunes and salt lake that dries up in the summer. It's one of the more accessible regions of the desert and has plenty of accommodations from which to choose for your trip. Backstory: Legend has it that after a wealthy family denied a poor woman hospitality, God buried the family under mounds of sand. Now, those dunes are known as Erg Chebbi, and they tower over the Merzouga village. Driving from Marrakech to the Merzhouga desert takes about 8 hours. You'll need to have four-wheel drive, an experienced driver who can navigate the area, and preferable a few movies to watch on your laptop. Once in the area, some camps offer a camel rise as transportation to the site. I'd advise against this option. Camels are quite possibly the most uncomfortable form of transport. This is made much worse if there is a sandstorm or rainstorm (we experienced both during our short time in the desert). If you're still curious, try a shorter (30 minutes is plenty) camel ride around the dunes once you arrive. But for the lengthier trip to your campsite, opt for a four-wheel drive vehicle. Although not nearly as popular a tourist destination as Marrakech and Fes, the Sahara Desert, and Merzouga in particular, has plenty of accommodation options. They'll range in price, but as mentioned earlier, price will coordinate with your comfort while there. You can find a beautiful riad in Marrakech at a budget-friendly rate, but in the desert, you I recommend splurging a bit. I've heard stories of lower cost desert camps that didn't have enough food and drinking water for guests, required guests to take a camel on the two-hour trip to the site (despite a sandstorm), and were dishonest with money. In Marrakech, you can easily switch to a new riad. In the Sahara, you're sort of stuck. So choose wisely. As noted above, I recommend Sahara Stars Camp for a beautiful, comfortable, and luxurious desert camp. If you choose to stay in a bed and breakfast for a day (or a few) surrounding or instead of your glamping experience, I recommend Auberge Takokt. You don't know one sand dune from the next. Local guides even have names for every dune. They won't get lost, but you certainly will. Storms are possible. Sand storms, or even flash floods, are not unheard of in the Sahara, and we experienced both while there. Our guide knew which flooded areas were safe to drive through and which would leave us stranded. He also probably could have navigated the desert blindfolded, so sandstorms were no concern. You'll miss so much of the culture. If it weren't for Amed's background, experience, and love for his culture, I would have never learned as much as I did about Berber culture. And it was the cultural insight and activities that really made us all love our desert getaway as much as we did. I can't recommend our tour company enough: Best Travel Morocco. Amed and our driver, Hassan, were not only a blast to travel with, but they were incredibly knowledgeable about history, culture, accommodations, and activities. They helped us steer clear of tourist traps, find the best viewpoints for sunrise and sunset, and gave us the authentic Morocco experience we wanted. Morocco is one of the most diverse and beautiful countries I’ve visited. Although paying a visit to the famous cities, mosques, and markets is a must, don’t leave Morocco without a trip to the Sahara Desert. I could have spent a week (or even a month) out there, and even just writing this post is sending me straight back to those three days in desert paradise. Add it to your Morocco bucket list and you won’t be disappointed. Have you visited the Sahara Desert? If you have any extra tips or questions, please leave them in the comments below!